Colorado is a majestic place, with the massive ridge of the Continental Divide bisecting the states two agricultural regions and providing over 14 million forest acres for recreation. 14,000 foot mountains grow like trees, and the winter snow pack provides water for six states and Mexico. 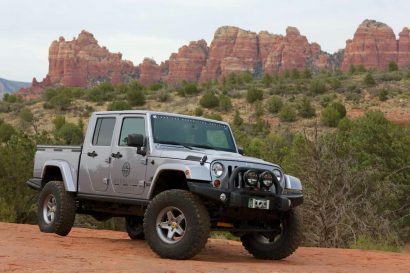 Colorado also provides near endless off highway recreation opportunities, from technical rock crawling trails to endless exploration above tree line. For me, the adventure started on I70, with my Tacoma gasping for air trying to pull 6,000 lbs. up the 6% grade to the exit at Dillon. This massive highway and Eisenhower Tunnel is an incredible engineering accomplishment, and allows quick access from Denver to the mountain towns and trails in the National Forests. Our camp for night one was at over 11,000 feet along Deer Creek, just up from the one stop sign town of Montezuma in the Arapaho National Forest. The trail to camp provided some early challenges, and worked as a gatekeeper to the armies of RV’s that flood the Divide in the summer. K.C. led the trail with his T100 Toyota fitted with a Four Wheel camper, 32” BFG’s and an ARB locker in the rear. I was impressed with how easily the T100 negotiated the cambered sections, large rocks and a series of rutted holes. Near the tree line, the trail opened into a small valley with spectacular views of Glacier Mountain and a meadow filled with wildflowers; what a perfect place to camp. Within a few hours the rest of the crew arrived, and we had a group of vehicles that would appear more at home in the Kalahari than the mountains of Colorado. In attendance were three Land Rovers, including Graham Jackson’s TDI 110 (www.africaoverland.org). The Toyota contingent included two Tacomas, two FZJ80 Land Cruisers, a third generation 4Runner, and a T100. Rounding out the group was a Nissan Pathfinder and a Diesel Ram. Within a few minutes of arrival, the camp started to take shape. Several Eezi-Awn roof tents were deployed, Hannibal awnings, showers, elaborate kitchens and the glow of a perfect fire. Leave it up to a bunch of overland types to set up a great bush camp. Part of the team hit the trail early the next morning, hoping to break trail into several snow drifts above tree line on the route to Radical Hill. With most of us having traveled together, we made short work of the drifts and put the first tracks of the season on Glacier Ridge. Climbing well above tree line, we continued to the top of Glacier Ridge, where the group was greeted by several Mountain Goats and a view of the western flank of Red Cone. Radical Hill was closed by a series of 100’ drifts, requiring us to turn SW and into Breckenridge. This route proved marginally better with several deep drifts, the longest being over 100’. Fortunately it was slightly down hill, and not on a shelf road. Being in the lead, I had the first chance to bust through the drift. I wanted to balance momentum with some caution, as I did not know if any big rocks were just below the surface. I engaged the rear locker and slid the Tacoma down the first section of snow. Traction was good and I had not broken through the surface, but I knew some speed would be required for the last stretch. Dipping into the throttle the 5.29 gears pulled the Tacoma forward and also started breaking the tires through the surface. Not enough momentum and I was stuck. Being stuck is not really a bad thing (in most situations), as it just gives a chance for everyone to work together and work with the recovery gear. Shovels came out and so did my Black Rat recovery bag. My tree strap was secured around the biggest rock available and the Warn M8000 started to pull; pulling rock out of the ground and not moving the truck. Plan B was for Nathan in his Camel Trophy Discovery to pull me backwards, allowing for another run at the drift. This worked great, and combined with some digging and more throttle, the Expeditions West Tacoma was on the other side. For the next hour, we worked at getting the rest of the vehicles through the drift. Each driver had a different style, which made for an exciting show. Within a mile, we had encountered several more drifts, all of which were easier than the first. Fortunately, we had gravity to our advantage as we dropped into Georgia Gulch, and followed the Middle Fork of the Swan River. Loosing a few thousand feet of elevation, the drifts lightened and the trail improved to a wide graded route and eventually our lunch stop at the Breckenridge Brewing Company. From Breckenridge it was over Hoosier Pass to South Park and then the major grades of the 22 rd. and Weston Pass. Even though the trail surface was in good condition, low range was still required for most of the trucks because of the thin air. Weston Pass provides quick access to the San Isabel National Forest and our camp for night two. Several of us had planned to climb Mount Elbert the following day, so a camp was chosen within a few miles of the trailhead. It was another great campsite in the trees with good food and even a few stories of Africa from Graham. It was another great adventure with friends, in one of the most beautiful regions of the world. Our camp would have made any African explorer proud, with several roof tents, volcano kettles, awnings and a great diversity of overland trucks. Graham’s turbo diesel 110 is an impressive machine, fitted with Safari Gard suspension, Technitop roof tent and numerous other modifications. This Colorado adventure was easy compared to their 30,000 mile expedition through Africa. Look for more on Graham’s awesome 110 in the future. 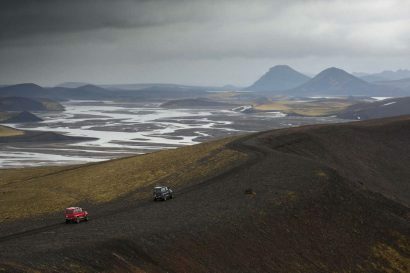 Nathan from Pangaea Expeditions, and his Camel Trophy Discover lead the convoy into the mountains. His truck was prepared for extended trips into Mexico and Central America with 235/85 MTR’s, Old Man Emu suspension and a rack full of toys. After the group dug the drift back, each vehicle made steady progress up Glacier Ridge. The influence of mining is evident throughout Colorado. The solitary cabin in this high mountain valley would have been a harsh existence. Brian and Heathers 3rd Generation 4Runner was very clean and well outfitted. A color matched ARB bumper, Old Man Emu suspension and a Yakima rack system helped make the truck even more capable. Despite his best attempt, the Disco was not able to find traction in the deep ruts left by the Expeditions West Tacoma’s taller tires. All of the available shovels went to good use, with the team removing snow from the drift. On his second attempt, Nathan attacked the big drift with perfect momentum, carrying the Disco through to solid ground. 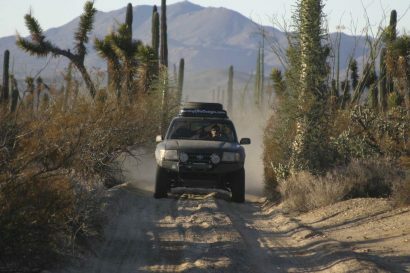 Chris easily traverses the drift in his Baja prepared Tacoma. His Taco sports an Engel fridge, Sleeping area, integrated aux. fuel and water, and several technical trail modifications. Scott had no problem with the drift, thanks to 35” tires on his FZJ80. Josh is a solid driver, making the trails look easy in his expedition prepared Discovery I, 5-speed. On the way home from Colorado, we took a detour through Monument Valley and did some scouting for a future Off-Road adventure.